Huang Dan is an artist. 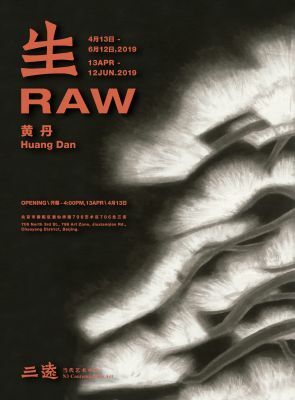 N3 Contemporary Art is delighted to announce the opening of Huang Dan’s solo exhibition “Raw”, on April 13. The exhibition will feature Huang Dan’s ink paintings created from 2014 to 2018 and will be presented in N3’s two-storied space. Speaking of the raw, other than life and vitality, I am more interested in talking about the immature, the raw (wild) power and the inexperienced and clumsy. Because of the raw power, one tempers oneself and ambles forward. It could be coarse, or even bloodily raw, like the pain and sense of an unknown fate in cell division. One then makes it possible to rebuild a system, a system of one's own, with the destructive power. Without the fearless vital power, it can never break ground. I tried to locate my true self in different stages of my life, then summarize it little by little in my own unique ways. After pondering, I express it in ink paintings. I follow my own laws of practice, with the direction never really changing, but I just progress slowly, step by step, I might only be able to advance one step for my entire life. Recently I've been painting trees, painting life, advancing towards the abstractions at a distance. I hate myself being trapped in the cage of figurativeness, looking forward to or even looking into the distance for abstraction. The pain of not achieving was previously mistaken for the meaning of trials and tribulations. I now realize that the pain stems from my own weakness. I was not sluggish or idle when sensing abstraction within reach, but I don't have the courage that I imagined, thus I am always lingering about at the same place. Self-accusation like this is my highest achievement in recent days. As far as I know, only through a profound experience and acknowledgment of pessimism, as well as calm and undaunted acceptance, one could achieve an epiphany and see the vitality of life surging everywhere. I see the impulse to represent all these ideas as inevitable—the representation originates from my admiration of that vitality, through various objects and situations—what is surging is the invincible power, the unquenchable vitality. The spark of vitality built upon pessimism, knowing that laws are unbreakable but still surging, remarkably deserves appreciation. Here are my hymns.